I am excited because today is my last day in the office for the week. Christmas is now just a few days away! Atlanta is also experiencing some surprisingly nice weather: it's going to be in the 60s today. 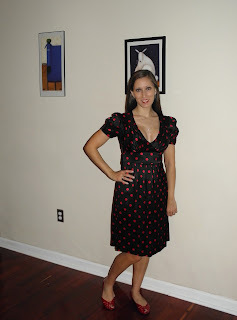 I decided to take advantage of the warmer weather to get out the dress I wore last Christmas: this silk Betsey Johnson red and black polka dot dress. I love the puffed sleeves and overall 50s look of the dress, and it's pretty comfortable. I paired it with my Stuart Weitzman Conchita red patent flats that I haven't gotten to wear in ages. I tried on a few different pairs of shoes with this dress, but these go the best. I couldn't find the dress online, but Dolce&Gabbana just released a beautiful red and black polka dot dress that Reese Witherspoon actually wore to accept her star on the Hollywood Walk of Fame. It's nice to know I'm "on trend"... though I will never in my wildest dreams be able to afford D&G. Chapin and I are staying in Atlanta for the Christmas holiday, so we're happy we don't have to spend half our vacation traveling. I'm excited to get to relax and spend time with my family. Merry Christmas! Wishing you a very happy coming new year.